Property developer IJM Land Bhd's efforts in turning "The Light" waterfront project into Penang's first green development, will see the company putting about 5 per cent of its construction costs into green-related technologies. 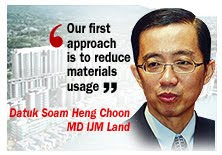 Its managing director Datuk Soam Heng Choon said the company is fine-tuning basic design or passive design to cut its reliance on high-technology products for IJM Land's flagship waterfront development in Penang, which carries a development value of RM5.5 billion. Among others, emphasis will be placed on tapping into natural lighting and cross-ventilation of buildings. "Our first approach is to reduce materials usage for the project, rather than specifically source for recycled materials," he told Business Times. Referring to the use of optic cables as an example, Soam said a single core of fibre optics would tremendously reduce a lot of copper cables and yet provide better quality of service to the occupants. "However we are still sourcing for appropriate sustainable recycled materials for this project, where possible," he said. Among the few green construction materials identified by IJM Land so far include recycled pavers and composite timber. The Light, which serves as IJM Land's crown jewel, spans 60.8ha of reclaimed land along the eastern coastline of Penang island. The project stretches from the Penang Bridge to the city centre. IJM Land is the property arm of IJM Corp Bhd, and is the result of a merger of IJM Properties Sdn Bhd and RB Land Holdings Bhd. Phase one of The Light is a 16.8ha residential precinct which includes The Light Linear and The Light Point condominiums. Both The Light Linear and Light Point will be built according to green standards. Soam said IJM Land, which is working towards complying with Malaysia's Green Building Index (GBI) certification, said rainwater harvesting would be incorporated to reduce water consumption for landscape purposes. "We also plan to provide a dedicated space for the recycling of household waste for all residents of The Light. "Educational talks on recycling will be conducted regularly for residents and proceeds from the recycling programme can be donated to charitable organisations," he said. Apart from using energy-saving lights and air-conditioners with built-in invertor technology in every unit in The Light, Soam said that a centralised vacumn system would be fitted in all units of The Light Point and The Light Collections to reduce the amount of airborne particles that might be reintroduced into the habitable space. On the advantages of having these green-technology items installed in each unit, Soam said that the inverter air-conditioner, for instance, could help the user lower the power consumed by 60 per cent. IJM Land Bhd, which serves as the property arm of IJM Corp Bhd, was the result of merging IJM Properties Sdn Bhd with RB Land Holdings Bhd. As part of its greening mission with "The Light" waterfront project, IJM Corp seeks to tap the indigenous environmental elements which have contributed to the Penang essence, or Penang air, which the locals and foreign visitors love, seek and enjoy. For The Light project, new trees will be planted and ample greenery integrated to create green zones that will enhance a visit to the site. The RM5.5 billion project, to be developed over the next 12 to 15 years, has been designed to rival landmarks such as Canary Wharf in London, the UK; Docklands in Melbourne, Australia; and Queens Quay in Toronto, Canada. The developer has appointed six Malaysian architectural firms to design the residential components in the first phase. The project will be developed over three phases. Among the eco-friendly initiatives that will reportedly be carried out by IJM in developing The Light is the harvesting of coral reefs in the waterways that will be built around the residential units. Apart from ensuring a healthier marine life, the coral reefs will add aesthetic appeal to the development, notably at night, when they will be lit with a soft underwater glow. The underwater glow, to be powered by wind generators, is expected to give residents a view of what is underwater from the balconies or windows of the units. KUALA LUMPUR: Bukit Kiara Properties Sdn Bhd (BKP) is moving beyond its home turf of Mont’Kiara to develop The Ambangan in the vicinity of Embassy Row in the U-Thant area of Ampang. The exclusive freehold five-storey condominium project will have only 19 units and will be sited on slightly less than an acre in Persiaran Madge, according to BKP group managing director N. K. Tong. Each unit will have a built-up area of about 3,000 sq ft. The area is home to several small boutique developments which have sprung up in the last 10 years. Malaysian, South Korean and Singaporean developers had in the early part of the millennium converged on the U-Thant/Madge area because it was seen as offering an alternative to the Kuala Lumpur City Centre (KLCC) site. Divided by Jalan Tun Razak, the U-Thant area’s land prices were trailing that of the KLCC area, and because the authorities had a height restriction for the U-Thant area, the financial outlay was also reduced without compromising on exclusivity. Rental yields in the KLCC area have of late come under pressure, while those in the highly populated Mont’Kiara have dropped since the fall of Lehman Brothers in September 2008. N. K. Tong is the son of “Condo King” Datuk Alan Tong of the Sunrise-Mont’Kiara fame. It was Alan Tong who saw the potential of what was then known as Segambut and renamed it Mont’Kiara. That location turned out to be a hit. When Alan Tong subsequently left Sunrise, his son set up BKP in 2000 but remained on what was then his father’s home turf. BKP has three projects, all at Mont’Kiara. It is currently selling Verve Suites, a four-tower development, of which two towers have been fully sold, while 85% of the third tower has been sold. The fourth tower will be launched in the second half of the year. N.K. Tong’s foray into Ampang is significant in more ways than one. Sunrise Bhd, one of the first developers in Mont’Kiara, is also beginning to go beyond the area into the city centre and Bukit Jelutong, with a new strategy to offer multiple products in multiple locations. KUALA LUMPUR: Puchong Gate Development Sdn Bhd, a relatively new player in the property scene, is actively looking for land or potential joint ventures with other developers for future projects. Executive director Khoo Boo Tee said the company was eyeing potential developments mainly within the Klang Valley. Khoo said Puchong Gate would focus on developing niche projects. “We’re not focusing on mass developments unless we have a large land-bank,” he said. Puchong Gate is a unit of Newfields Group, an established financial advisory firm set up in 2002. In 2004, Newfields ventured into property development and launched its maiden project, Puchong Gateway, a 52-acre integrated commercial hub next to the Damansara-Puchong Highway in southern Puchong. 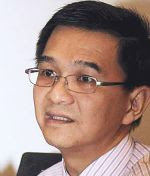 Khoo said the first phase, comprising 104 units of 2½ and three-storey shoplots, was completed and delivered six months ahead of schedule in April 2009. Late last year saw the launch of the second phase, Gateway Square, which comprised 66 units of two, three, four and five-storey shoplots. Khoo said about 70% of the units, priced from RM808,000 to RM2mil, had been taken up. Business operators that had taken up space in the first phase include a range of food and beverage outlets, furniture and car showrooms, petrol kiosk and offices. Earthworks for the second phase have been completed and construction is expected to begin in mid-February. Khoo said the third phase would primarily take the form of a residential scheme of 500 serviced apartments with some elements of retail to complement the commercial development. “It depends on market demand but we hope to launch the third phase by early next year,” he said. The group also has plans for residential and commercial projects in Bukit Serdang and Jalan Tun Razak respectively.